Now, when I say surfing you might imagine the music of the Beach Boys: “Surfin’ USA” and “Surfer Girl.” Surfing was pretty popular for a while in the United States. There were even movies made about the sport! But surfing wasn’t invented in the 1960s by kids in flip-flops. No way! Surfing has been around for hundreds, maybe thousands of years! Some people have even found evidence of surfing in ancient South America! 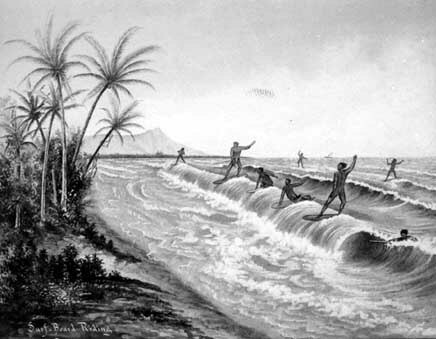 But the surfing that we all know and love first originated in Polynesia. (That’s one part of Oceania.) Can you guess why? With all those long sandy beaches and warm water, who wouldn’t want to dive in and enjoy it! And what better way to enjoy the view than from a whizzing surfboard? In Samoa, surfing was originally known as fa’ase’e. The early European explorers that visited the South Pacific islands were the ones who gave it the name it has today. They called in surfing because surf means the part of the ocean where the waves crash and break. That’s what gives surfers the power to shoot along the water with such speed. The bigger the wave, the higher the speed! Surfing was common in many parts of the South Pacific, from Tahiti to Hawaii. When people first started surfing, they stayed on their bellies on the boards. But soon some people were so good at balancing, they were able to stand up! Back then, people surfed for the same reason they surf now: To have FUN! Today, surfing has spread all over the world. If there’s an ocean and there are waves… there’s surfing. Young and old, human and animal, everyone loves surfing!